AMD processors in Chromebooks are finally here at CES 2019, which could lead to lower prices and possibly stronger graphics than we’ve seen in such laptops before, and the HP Chromebook 14 is among the first. All told, the new HP Chromebook 14 looks and feels like most other budget-oriented Chromebooks – the only major differences between it and HP’s Intel-based Chromebook 14 are the insides. Unfortunately, the benefits of that are tough to grok from a brief hands-on. Regardless, here’s what to expect from the HP Chromebook 14 when it launches later this month. All iterations of this HP Chromebook 14 come packing AMD’s dual-core A4-9120 processor, 4GB of DDR3 memory and 32GB of eMMC flash storage. HP is asking for a completely tolerable $269 (about £211, AU$378) for the AMD-based Chromebook 14 to start, which comes rocking a 14-inch HD (1,366 x 768) display. From there, it’ll cost you $299 (about £235, AU$420) to get this laptop with an FHD (1,920 x 1,080) display with in-plane switching tech for boosted viewing angles. To have the Chromebook 14 with a straight HD display with multitouch capacity, it’ll be the same $299. The higher-end option of sharper screen resolution without multitouch or lower display resolution with touch control is a welcome choice we’d like to see in future Chromebooks. HP’s Chromebook 14 with AMD inside doesn’t look all that much difference from its budget Chromebooks with Intel inside. The laptop is wrapped in textured plastic that’s finished with your choice of “Chalkboard Gray” or “Snow White” colors – or in “Ink Blue” for the $299 options. The laptop looks downright utilitarian, with a single color all around a chassis that measures a just-fine 0.72 inches (18.2mm) a weighs a completely average 3.4 pounds (1.5kg). This basic design leaves enough room for not only two USB-C 3.1 ports but also two USB 2.0 ports and a headphone jack. That’s plenty of expansion for such a cheap laptop, but the Chromebook 14’s budget nature shines through in its keyboard and touchpad. These are not the premium inputs you’d find on one of HP’s Spectre laptops. Rather, this keyboard is rather squishy, meaning the feedback of the keys isn’t strong enough for our taste, but the keys are at least well-spaced. Likewise, the touchpad isn’t as smooth and is coated in plastic, not glass like the luxury laptops. That said, it’s a perfectly serviceable touchpad for everyday use. As for the display, we find it to be just like all the other HD-only Chromebook screens, bright enough but overall all on the blue side of the color reproduction spectrum. It won’t be the best display for watching movies on from bed or the couch – though, the Bang & Olufsen-tuned speakers might make up for that – but the screen will do just fine for basic work. We won’t make any hard judgements on the HP Chromebook 14 power profile, but we have a good idea of what to expect. The AMD A4-9120 inside is clocked at 2.2GHz and can boost up to 2.5GHz. The HP Chromebook 14 processor starts where most Intel based options are able to boost to, which should see it gain a slight edge over competitors in raw throughput and graphics rendering. As for longevity, the battery inside is rated for up to 9 hours and 15 minutes with mixed usage. This was never going to be the longest-lasting laptop in the world, but it should get you through a whole work day on a single charge. We’ll be the final judge on both in a full review. 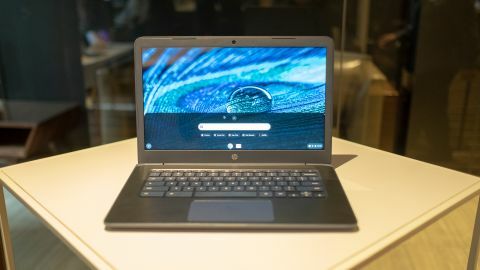 One of the first Chromebooks packed with an AMD processor inside, the HP Chromebook 14 is an interesting surprise at CES 2019. However, it’s tough to predict the impact an AMD processor will have on the Chromebook experience right now. That insight will only come through in a full review. Until then, you’re looking at a just-fine, long-lasting Chromebook with a new kind of processor inside. Look out for the HP Chromebook 14 with AMD inside later this January.